The book of Acts contains the only biblical narrative of the events that occurred in the early church between the early first-century ministry of Jesus and the early to mid-second-century emergence of the Christian apologists. As such, the book of Acts has come under increasing scrutiny in recent years. These present groundbreaking essays reveal the best in contemporary thought about this fascinating one-of-a-kind book. The authors in this volume provide us both with snapshots of the most pressing questions in contemporary Acts scholarship and with succinct expressions of the best answers for those questions. This volume is more than a mere restatement of the status quo. Rather it is very much an exploration, but an exploration guided by seasoned Acts scholars. Perhaps most importantly, many of the contributors pay particular attention to the question of the origin and reception of Acts as a pivotal document within early Christian thought. Together they call for a reconsideration of many widely held, but not well-defended truisms in Acts scholarship. These new investigations into Acts originated from the 2006 and 2007 meetings of the SBL section on ACTS. 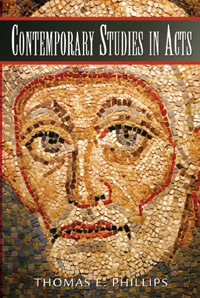 These essays reexamine the origin and reception of Acts as a document within the larger world of early Christianity. The list of contributors includes both well-established and emerging leaders in Acts studies.